The holiday season is over, and we still have a few weeks of winter ahead of us, but that’s no reason to hole up at home. Here is our pick of the best five Prague exhibitions to see this winter — get your dose of culture indoors, away from the cold! In Prague, you’re never too far from museums, galleries, theaters, and other cultural sites, and a single visit to a museum or a gallery can expose you to in-depth information on a subject and boost your intelligence. UNYP's pick of the museums and galleries with don’t-miss exhibitions this winter in Prague. After exhibiting European artists for almost a year, Gallery Rudolfinum presents a solo show by the acclaimed US filmmaker and artist Arthur Jafa. During the past thirty years, Jafa has developed a dynamic artistic practice that questions prevailing cultural assumptions about race and identity, ranging from films and installations to performances and happenings. This exhibition is organized in cooperation with the Musée départemental Breton. Brittany was an attractive destination for artists during the late 19th and early 20th centuries, and in the summer of 1888the Pont-Aven school became a major center for young painters who took on the style known as Synthetism under Paul Gauguin’s informal tutelage. The exhibition provides details about the artistic achievements of Czech artists in Brittany between 1850 and 1950 and evaluates the influence of the Pont-Aven school on their work. 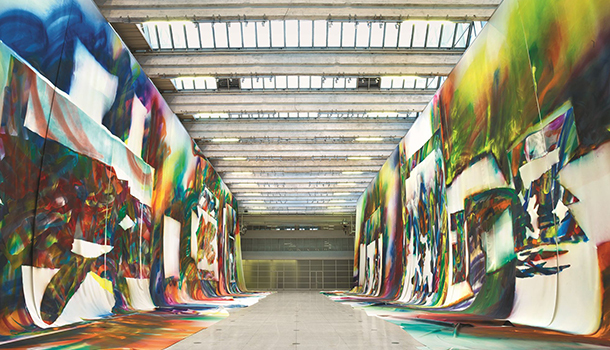 German artist Katharina Grosse has created a large-scale, site-specific painterly installation which represents the sublime act of a lovers' embrace towards space, architecture and the viewer. Her “Wunderbild” is an architectural painting that became a direct response to the National Gallery's late 1920s functionalist industrial space. Epic in scale, this mesmerizing installation reminds the viewer of both a medieval mural and a prehistoric cave drawing. This photography exhibition could be of particular interest to our Literature program students. In June 1967, the French photographer Gisèle Freund visited Prague during the legendary Fourth Congress of the Union of Czechoslovak Writers and captured such famous Czech writers as Václav Havel, Milan Kundera, and Pavel Kohout. The collection includes portraits of the legendary Czech photographer Josef Sudek. This Winter, the Municipal House will be presenting an exhibition dedicated to the world-famous Czech fashion designer, Blanka Matragi. Her career began with winning the Czechoslovak Young Clothing Designer competition in 1976. This exhibition contains exquisite garments and accessories, as well as glass, porcelain, sculpture, and graphic art.